Whether it's a delicate green tea or a bracing Assam black, a cup of tea is a complex brew of art and industry, tradition and revolution, East and West. 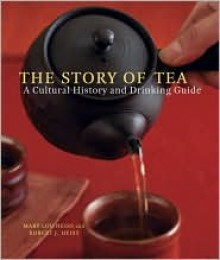 In this sweeping tour through the world of tea, veteran tea traders Mary Lou Heiss and Robert J. Heiss chronicle tea's influence across the globe and provide a complete reference for choosing, drinking, and enjoying this beverage.The Story of Tea begins with a journey along the tea trail, from the lush forests of China, where tea cultivation first flourished, to the Buddhist temples of Japan, to the vast tea gardens of India, and beyond. Offering an insider'­s view of all aspects of tea trade, the Heisses examine Camellia sinensis, the tea bush, and show how subtle differences in territory and production contribute to the diversity of color, flavor, and quality in brewed tea. They profile more than thirty essential tea varietals, provide an in depth guide to tasting and brewing, and survey the customs and crafts associated with tea. Sharing the latest research, they discuss tea's health benefits and developments in organic production and fair trade practices. Finally, they present ten sweet and savory recipes, including Savory Chinese Marbled Eggs and Green Tea Pot de Crâme, and resources for purchasing fine tea.Vividly illustrated throughout, The Story of Tea is an engrossing tribute to the illustrious, invigorating, and elusive leaf that has sustained and inspired people for more than two thousand years.